Due to rain, the Emory Veterans Day Ceremony moved from the Quad to Cannon Chapel. 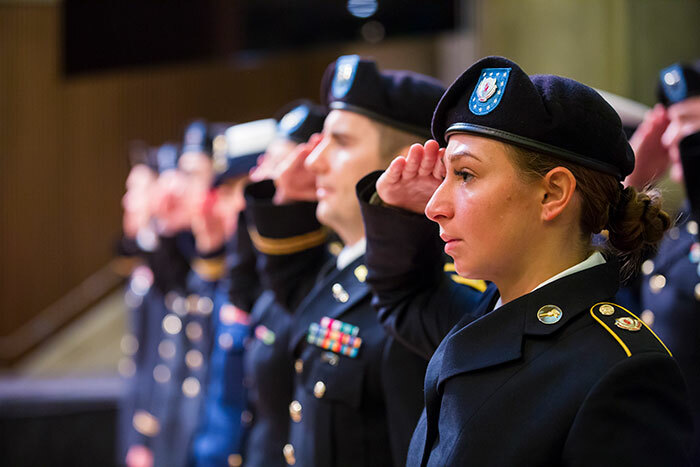 The 10th annual ceremony honored veterans and active duty service members who are Emory students, faculty, staff and members of the broader community. Guest speaker Capt. 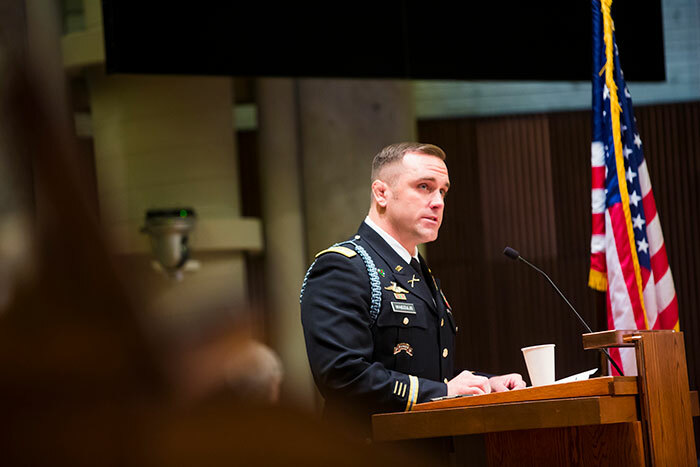 Jason Waidzulis is an MBA student in Goizueta Business School who will return to active service in the Army after completing his Emory degree. 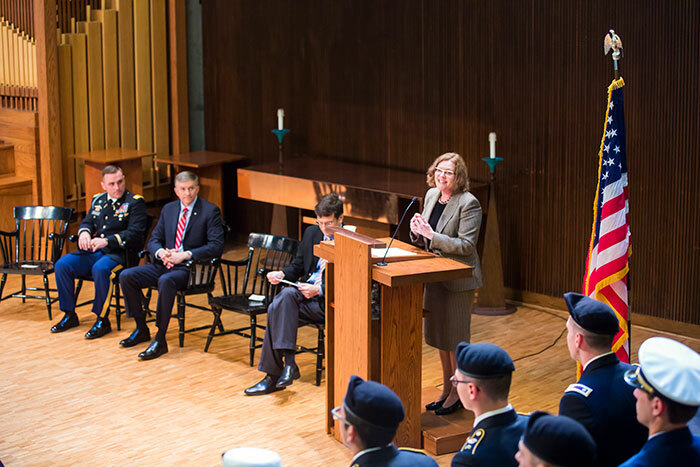 Emory President Claire E. Sterk spoke of the university's commitment to veterans as students and in the community. Lt. Gen. (ret.) William “Burke” Garrett III serves as executive adviser to the Emory Healthcare Veterans Program. He discussed the ways veterans continue to serve and how Emory is working to help them with issues like PTSD and other "invisible wounds." 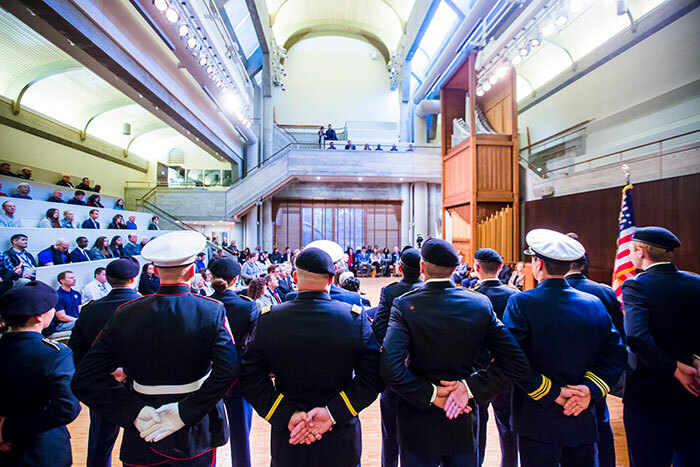 The Emory community filled Cannon Chapel on Monday to honor the service and sacrifices of veterans and those currently in the U.S. military. As cold rain fell outside, the university’s 10th annual Veteran's Day celebration — held Nov. 12 since the official holiday, Nov. 11, fell on Sunday this year — began with a solemn honor guard procession to the flag at the front of the chapel. Jeff Rosensweig, Goizueta Business School associate professor of finance and founding faculty sponsor for the Emory Veterans Association, welcomed attendees and introduced the ceremony's first speaker: Army Capt. Jason Waidzulis, an MBA student in Goizueta Business School who has been deployed six times in support of combat operations in Iraq and Afghanistan. Waidzulis, who will return to active duty after completing his Emory degree, noted that Veterans Day began as Armistice Day, a commemoration of the end of World War I, that was “supposed to be the war to end all wars.” With 2018 marking the 100th anniversary of the armistice, “today we wish that were true,” he said. He recounted the millions of soldiers and civilians who served or were killed in that war and all wars since, and noted Emory’s ongoing commitment to service, from the Emory Unit that provided medical care in World War I and World War II to programs serving veterans today. “At Emory, this is not ancient history, this is our history,” Waidzulis said. After Waidzulis’ remarks, at approximately 11:11 a.m., ceremony attendees observed a moment of silence to mark when the armistice ending World War I took effect “at the eleventh hour of the eleventh day of the eleventh month” in 1918. Lt. Gen. (ret.) William “Burke” Garrett III, executive adviser to the Emory Healthcare Veterans Program, was the final speaker. 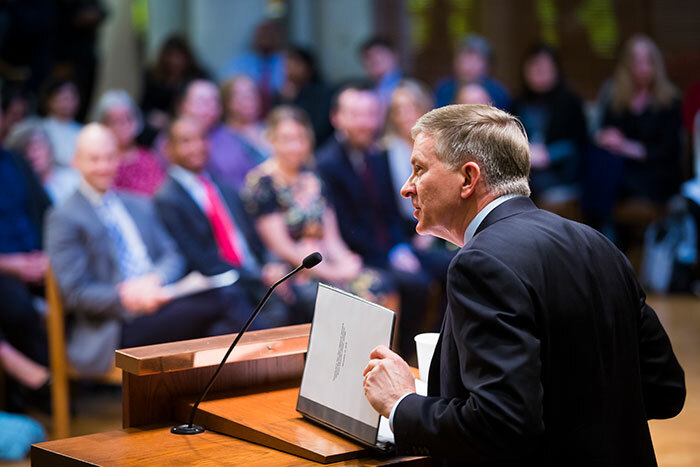 He encouraged the veterans in attendance to continue their service in three ways: leading to serve, preparing the next generation for service and taking care of those who have served. Garrett also described how Emory is working to help veterans with issues like PTSD and other "invisible wounds,” recognizing Marine veteran Timothy Banik, who struggled with PTSD until receiving treatment at Emory and now works to help let others know about the services available through the Emory Healthcare Veterans Program. Banik, his wife and his therapist were asked to stand, to rousing applause from ceremony attendees. “Like all of our veterans, Tim represents the best of who we are as a nation,” Garrett said. “He has sacrificed for us and bears the unseen scars … and he is an example of what is possible when we express our gratitude not just in words, not just on one day, but through deeds every day.